Polycarbonate tray on tray meal delivery systems. Available in five compartment base trays and three compartment insert trays. 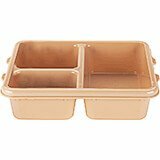 Works as a stand-alone cafeteria tray or for in-cell feeding with the insert tray. Textured to reduce scratching. 14-3/8" X 10-9/16" X 1-1/4"
Tray on tray meal delivery system, Base Tray. Includes five compartments with one compartment for nesting the insert tray. 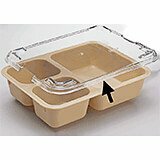 Works as a stand-alone cafeteria tray or for in-cell feeding with the insert tray. Textured to reduce scratching. Insert tray and cover lid not included. Case of 24, not sold individually. 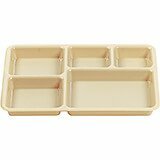 8-11/16" X 6-5/16" X 1-7/8"
Insert Tray for Tray on Tray meal delivery systems. Polycarbonate material. Designed specifically for cook-chill applications as it can be covered with heat seal film or snap-on cover (sold separately). Eight trays efficiently fit on a standard sheet pan or in an 18" x 26" wire rack. Three deep compartments for ample portions. Textured to reduce scratching. Case of 24, not sold individually. Snap-on cover fits securely insert trays for tray on tray meal delivery systems. Textured to resist scratching. Case of 24, not sold individually.